Our district has changed our fiscal year. How do I adjust for this in NTS? How do I change my fiscal year Start or End dates? A simple adjustment of the Fiscal Year Start/End dates is all that is needed. In the upper left corner of the checkbook screen, click on the fiscal year start or end date. See the example below. A warning message will appear asking to confirm that the fiscal year date needs to be changed. Click Yes to continue. NTS versions 5.70 and above: Choose the new start/end date from the calendar. Once the date is selected, double click on the day or press Enter to set the date. 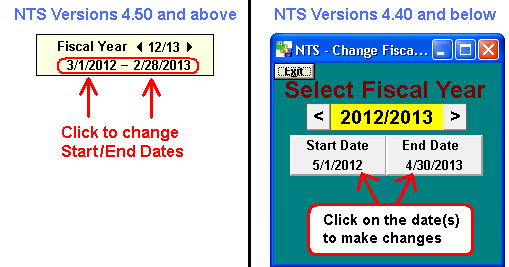 NTS versions 4.50 to 5.64: Choose the new start/end date from the calendar and then click OK.
Click on the Fiscal Year button at the top of the Checkbook screen. Click on the start or end date. See the example below. Choose the new date from the calendar and click OK. It may be necessary to change either the start and/or end date when you start the next fiscal year.